The Aicon Gallery (formerly Arts India) Palo Alto, in collaboration with the Art Alive Gallery, New Delhi – is showcasing yet another of India’s versatile talents – Yusuf Arakkal. The Bangalore based artist, also known for his sculpture and poetry, speaks from his heart with this latest series of paintings. Titled “The Street”, the work powerfully portrays slices of life on the streets experienced by various segments of the human diaspora. Yusuf Arakkal has been candid about his experiences of a time when he was forced to live on the streets of Bangalore. It is part of his long journey that has brought him to this stage of personal expression. Without overly dramatizing his life, the artist has spoken plainly. “The Street” is a story, both personal and impersonal at the same time. I visited Aicon on a Sunday afternoon aware that this time around, I was going to be a true “viewer”. Unlike the last show (Indrapramit Roy), I would not have the privilege of meeting the artist in person and seeing the work through his eyes. Mr. Arakkal was not present for the opening. The work would speak for itself. 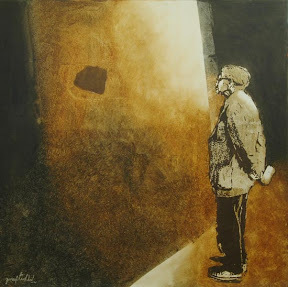 Walking into the gallery you are immediately drawn to the wall facing the door. A large painting in three parts – a triptych, catches your eye. It is in essence a portrait of a young child of the streets. The far left and right panels are a bird’s eye view of the child with a steadfast gaze fixed up to your face. There is a brutal honesty about that gaze that either draws you like a magnet or makes you want to look away. More often than not, the latter is what we choose to do. Looking away is easier in the face of such a bleak picture. The artist resorts to a frame-by-frame method of portraiture in the central panel. 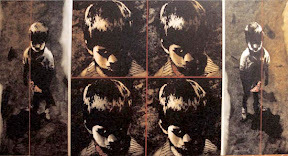 Four closeup shots of the child’s face forces the viewer to look again and yet again… into those eyes that speak of truths we might not have the courage to know. I was captivated. Looking around, you notice that many of the paintings have the same repetitive elements. Figures reading newspapers, on bicycles, walking along with cell phones held to their ears, standing around in contemplative silences – are all depicted in twin images, sometimes in triplicate. Each depiction is slightly offset from the previous. Like echoes of echoes, it is a clever way to get the viewer’s attention. It heightens the reality that begs to be taken in and observed. Picking up the accompanying catalog from a nearby table, I discovered a wonderful collaboration between two artists at the height of their creativity. The catalog in itself is a work of art. Nemai Ghosh – popularly known as Satyajit Ray’s photographer, is an artist in his own right. Mr. Ghosh has captured Yusuf Arakkal in his studio during the creation of this body of work in a series of black and white pictures that are truly engaging. The catalog tells a story within a story. It faithfully captures minute details of the working process and the man behind the creativity. I was compelled by the catalog and the pictures within, both from the perspective of a student of art and a viewer. Mr. Arakkal’s technique of creating this compelling series is interesting. His location studies are transferred onto the canvas using the printmaking method of silk screening. 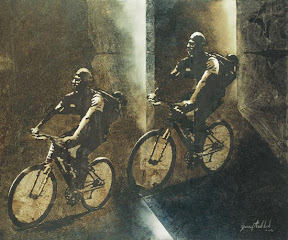 He then paints over the transferred image using a subtractive method of painting that creates dramatic light and shadow effects within the paintings. Oil paints are laid over the image and wiped off with a soft cloth. I found this technique to be almost symbolic of the manner in which the artist wipes the patina off the viewer’s psyche to better engage with the subject at hand. The color palette is very subtle, akin to a sepia tone in some pieces. In some others the artist introduces color very carefully taking care not to overpower the central element of the work. The use of the color red was another powerful tool. Used sparingly, the red lines sometimes outline the frames within the paintings or emphasize some detail on the figures, serving to create a punchline effect. This entry was posted in Features on June 28, 2007 by vpdot.